Dreaming about that beautiful, straight smile? You can now have it without wearing braces. Call us at our office and learn about Invisalign. We will schedule a complimentary consultation for you and help you determine if it is right for you. Invisalign is an orthodontic system like braces and no one can even tell that you are wearing them. They are comfortable and unnoticeable. If need be you can also remove them for short periods of time. You can now flaunt your smile with confidence by using Invisalign. These aligners, made using 3D computer imaging technology, build on each other until your teeth look straight and perfect! The aligners are invisible, and hence more desirable than traditional braces. There’s no need to adjust your diet or avoid foods that could damage traditional braces. You are not inconvenienced with the tedious hassle of brushing and flossing around brackets and wires. Most Invisalign patients have suggested that they are more comfortable than any metal braces. They do not rub against the soft tissues of the mouth and neither do they cause soreness. Also, there is no need for routine adjustments, hence, less time spent in the dental chair! 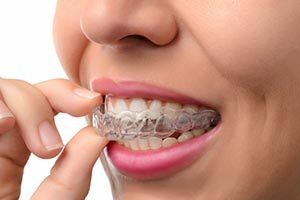 A series of aligners will be created that will slowly move your teeth into the desired position. The aligners should be worn as much as possible and only be removed when drinking, eating, brushing, and flossing. Each aligner is worn for about two weeks before moving on to the next aligner in the series. Invisalign patients have regular visits every 6 weeks to check the process of their treatment. Most treatments will be completed within 15 months. If you live in Westchase or the Tampa area, Invisalign treatment is not out of your reach. Contact our Tampa office to schedule a free consultation and see if Invisalign is right for you!